Use DOSBox for DOS version. Freeware, available here. Included in GOG.com version. DOS/32A is a more advanced extender and open source replacement to DOS4GW. It can improve both performance and stability of Shattered Steel greatly. To make SS8MEG.BAT compatible with DOS32A, replace the line set DOS4GVM=MAXMEM#16000000 with SET DOS32A=/EXTMEM:16000000. Go to MOVIES in the installation folder. Delete or rename FILM7.MVE and INTRO.MVE. The Interplay, BioWare and Shattered Steel screens will still be shown. Patch 1.12 updates the retail version to the latest version. The GOG.com version already has this patch. Can be forced to run in 320x200 mode with the parameter -no640. Movies can also be forced to run in "windowed mode" with the parameter -window. Select a different controller type then switch back to your original to reset it's bindings to their default values. 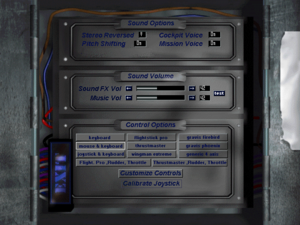 Cockpit/mission voice commands are not subtitled. Redbook audio initialization can be skipped with -nocd paramiter. Note does not disable CD check. Via IPX tunneling (the GOG.com version is pre-configured). 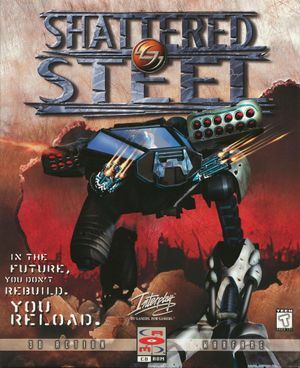 Edit the DOSBox configuration file; for the GOG.com version this is dosboxShatteredSteel.conf. Change timed=true to timed=false (if it is already set to this, try timed=true instead). Save your changes and run the game again. If problems persist ensure the in-game axis handling (Incremental or Absolute) matches the real axis. This issues commonly occurs if you installed the game on an older version of Windows without restarting in MS-DOS mode then attempt to run the game from DOS there after. Change the various paths and drive letters to Shattered Steel's install location ensuring they're 8.3 name compatible. You could also replace them with .\ though this requires having the game's directory be the current active one. ↑ 2.0 2.1 File/folder structure within this directory reflects the path(s) listed for Windows and/or Steam game data (use Wine regedit to access Windows registry paths). Games with Steam Cloud support may store data in ~/.steam/steam/userdata/<user-id>/624060/ in addition to or instead of this directory. The app ID (624060) may differ in some cases. Treat backslashes as forward slashes. See the glossary page for details.